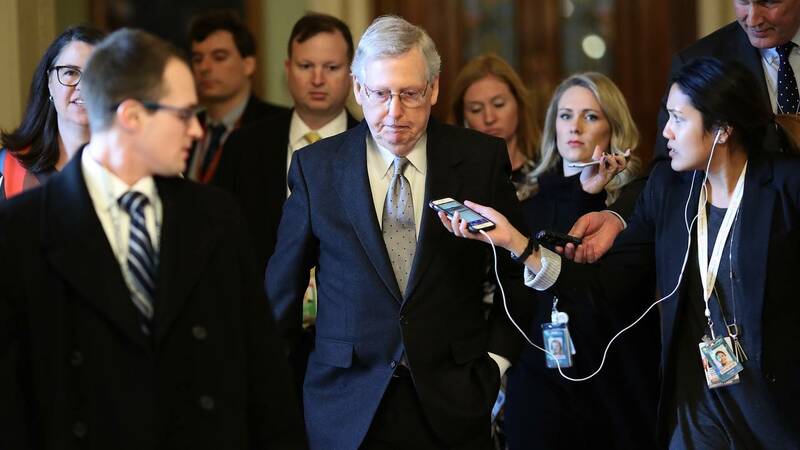 Senate Majority Leader Mitch McConnell (R-KY) is trailed by reporters after speaking on the floor of the U.S. Senate on Jan. 22, 2019, in Washington, D.C.
(CNN) - The Senate will take two key votes on Thursday on competing proposals aimed at ending the ongoing government shutdown -- one backed by Republicans and the other backed by Democrats and both likely to fail. One of the votes will be on a proposal backed by Senate Majority Leader Mitch McConnell to fund President Donald Trump's border wall and reopen shuttered parts of the government. That legislation is in line with an offer the President proposed over the weekend offering temporary protections for some immigrants in exchange for $5.7 billion for a border wall -- and which Democrats swiftly rejected as they hold firm in insisting that the government should be reopened before lawmakers proceed to a debate on border security. Seven Democrats would have to crossover for the GOP bill to pass -- Republicans hold 53 Senate seats -- and there has been little indication that's possible. In late December, McConnell said on the Senate floor that when negotiations over the shutdown "produce a solution that is acceptable to all parties -- which means 60 votes in the Senate, a majority in the House and a presidential signature -- at that point, we will take it up on the Senate floor." It's a statement, in one form or another, McConnell had made repeatedly on the Senate floor and in weekly news conferences. But the back and forth last week between House Speaker Nancy Pelosi and the President, particularly when Pelosi sent a letter to Trump suggesting he move the State of the Union address due to the shutdown, led McConnell to a recognition that Democrats were simply not going to move off their position -- and it was time to get involved, two sources familiar with the decision said. On Tuesday, White House press secretary Sarah Sanders wouldn't directly say, when asked by CNN, if Trump would veto the plan passed by House Democrats to open the government. "The President has a proposal on the table. He's laid out what he would like to see and he's made that clear time and time again. The real question is why are Democrats not supporting the President's proposal? It actually is the very thing that they said they want to see happen for a long time on a number of fronts. The President's the only one in this process that's trying to help people Democrats claim they care about," she said, citing provisions in Trump's proposal for federal workers, DACA recipients, human trafficking and the opioid crisis. This story has been updated to include additional developments Tuesday.